A $14 million transformation brings Chicago the world’s most technologically advanced projection theater. 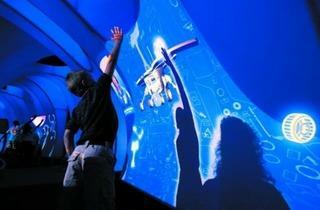 Photo: Jeremy Handrup At the Adler Planetarium's state-of-the-art Welcome Gallery, visitors can use their shadows to move projected images on a screen. Remember the Adler Planetarium’s Sky Theater, underneath the iconic dome? Reclining in tilted-back chairs circling the room’s 360 degrees, the audience would gaze up at a sky show created by the enormous Zeiss projector—a formidable old machine looming in the center of the room (which sometimes blocked the view of the action on the curved screen). Those days are gone, as much a relic as a centuries-old telescope. A $14-million overhaul, unveiled in July with the debut of the “Deep Space Adventure” exhibit, gives the city a completely transfigured Adler. Visitors now stroll into the futuristic Clark Family Welcome Gallery, where curvy walls slowly change color and serve as the screens for interactive projections. From there, visitors can (for an extra charge) enter the newly rechristened Grainger Sky Theater for an experience that, the Adler promises us, mere mortals have never had. You’re in a state-of-the-art, technologically advanced theater, projecting an extremely high-end image on the brand-new dome. It’s a fitting evolution for the Adler, which became the first planetarium in the Western Hemisphere when it opened its doors to the public in 1930. 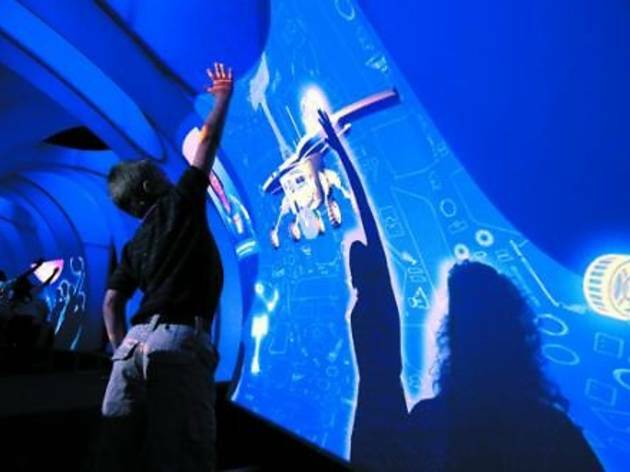 Now it’s leading the way again with the Grainger, which utilizes data from 45 computers and 20 state-of-the-art projectors to create its visuals. “Space has no right angles,” says Adler president Paul Knappenberger Jr., “so we didn’t want any right angles in our welcome gallery.” The walls seem to flow, thanks to the wavy shapes and the slowly pulsing colors—125 LED lights sit beneath the 20,000 square yards of white fabric, stretched over an aluminum frame. (Adler designers got the idea from an IIT professor.) “Do you see the rainbow?” an excited young boy asked his mom. The coolest part of the Welcome Gallery? Hands down, the enticing interactive modules. Actually, we should say “hands up,” because you’ll be using them: With the projectors above and behind you, recorded greetings flash onto the walls—like one from Chicago-born astronomer Joan Higginbotham, who invites you to help her build a Mars rover. And then you use your shadow to actually move the projections. Even adults can’t resist this seemingly magic act. The new Sky Theater looks totally different, too. Gone is the enormous Zeiss projector—the planetarium had two over the decades, each serving for 40 years—as well as the circular seating. Now up to 200 viewers at a time all face forward, aimed at the sweet spot on the 190-degree dome; there’s no bad seat in the house. “The goal is to make you feel like you’re on the observation deck of a space station,” chief technology officer Doug Roberts says. A bank of 45 computers with a combined 300 terrabytes of storage (yep, that’s a huge amount) can, at the whim of the projectionist, show actual images from space—for example, pictures of Saturn taken by the orbiting Cassini probe. The computers also contain the data for the new 22-minute film The Searcher, written by Nick Sagan (son of Carl). The visuals mix speculative fiction with lots of real science—collected by a number of sources, including the Adler, a NASA team in California and a supercomputing team at the University of Illinois downstate. When pressed, Roberts admits that high-end military simulators have more advanced tech—but for an open-to-the-public experience, the Adler is No. 1. “We don’t have a peer among planetariums in the world right now,” he says.